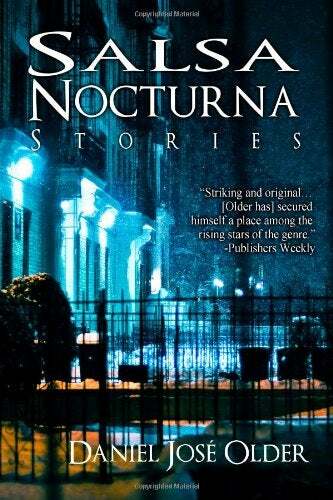 Daniel José Older’s collection of short stories from Crossed Genres Publications, Salsa Nocturna Stories, gives us a glimpse at a supernatural New York that feels surprisingly realistic. The NYCOD’s (New York Council of the Dead) only half-alive agent Carlos hunts rule-breaking spirits animals through the city nights. The older musician Gordo communes with dancing spirits every night at his new job. Victor is just an ordinary EMT who ends up embroiled in a magical battle. All of their stories fold in on each other, building a complete world in the background while the main story moves forward in the foreground. Characters who are simply mentioned in one story will be the narrator in the next one and then a supporting member in a third story. While none of the stories are truly dependent on one another to be understood or enjoyed reading them in order given provides a wonderful overarching nuanced meta-plot about community and resistance. Through the method of interlocking stories, Older is able to create his version of New York City as a character in its own right, a layered one that is both culturally and ethnically diverse. Often entertainment likes to give us all white, all middle-upper class versions of the city but Older’s take is closer to the real thing, minus the supernatural horrors, and this makes his city feel more alive than other fictional New Yorks. The author’s own knowledge of the city comes into play, mapping his mythology onto existing landmarks and neighborhoods. Older really shines in his characterizations, especially in the way that characters identities affect their interaction with the world. When Jimmy, a young black man, is describing a supernatural encounter and as an aside mentions how worried he was walking through the upper-class white suburban neighborhood where it took place, or how Ms. Cortazor starts off a little wary of the first white man to move into her building, or the fact that when African-American kids start turning up dead the NYCOD calls in it’s two agents of color, Puerto-Rican Carlos and his all-dead African-American partner Riley. Rarely are these the point of the story, they are usually little more than a line or two, but they add a truth and real world worry to his characters that is often missing with characters of color. Unfortunately the nuanced representation of ethnicity is not carried over to gender and the female characters. Unlike the more complex male characters women often appear simply as love objects or villains. The male POV characters think about and discuss women in a very “bro”-like manner. It's disappointing that the complexity and nuance of the male characters rarely shows up for the women. Of the three stories that feature a woman’s POV, two of them center on older women. This is interesting because the older female narrator is not that common but all the women seem more heavily locked into the plot of their tale than their male counterparts. The male POV characters have lives outside the story, jobs, lovers, pasts, crushes things we learn about them that have nothing to do with the story being told, this doesn’t feel like it’s the case with the women. The other story with the younger woman’s POV centers around sexual assault, not her own personal assault but still it’s interesting to note that the only representation of sexual assault in the book comes in her story. This also means that since both of the older women seem desexualized that all view of women’s sexuality happens through the male gaze and thus fairly limited. Older does not shy away from tackling hard subjects, though his handling of sexual assault leaves much to be desired the other ways that hierarchy work their way into his world are quite well done. Much of the quiet racism and prejudice we face in the real world is mirrored in Older’s world. In “Phantom Overload” the way the dead from other countries are coming to the U.S. to be with loved ones and facing destruction because of it echoes arguments of Immigration Reform. The cultural appropriation of history and belief without respect for the cultures being stolen from manifest as a magical struggle for power in “The Collector”. The battle of gentrification humorously (and grimly) represented by the accidental devouring of a hipster in “Graveyard Waltz”. Politics, power and the way these move along very specific lines isn’t ignored simply because the stories include elements of the fantastic. There are of course the overt villains in almost every story but interestingly enough they are not often the ones who feel like the main antagonists. Instead the problem more than anything seems to be the system that allows all of the problems to exist in the first place. Some stories actually leave characters with very little hope of winning against the system, that is why the form of the stories is so important. As the stories build on one another slowly a community forms of people willing to fight and able to actually thwart the system some of the time. One detriment for myself as a reader was that the world created seemed to be entirely populated by heterosexual folks. The couple of instances that hint at someone being otherwise are quickly shut down and denied by the people in question. Now this could have been an interesting commentary on cultural expectations of sexuality, one I wouldn’t have necessarily agreed with but would have been able to comprehend. As it was the suspicion of alternate secualities to be followed by denials left me confused more than upset. In a series of stories where power in the world today is examined and how the current political climate is it would seem like a rich place for exploration and so feels like a missed opportunity. Older is a talented writer, subtle enough to hint and allow the reader to make connections on their own. He creates a universe where the supernatural interweaves with everyday life despite restrictions, where it’s normal to have a bruja in the family and a touch of the sight. It’s the simple acceptance of the supernatural and it’s place in the natural world that is one of the best aspects of his New York City. Unlike many Older’s magic does not work in a set proscribed way all the time. Other than ghosts no supernatural creatures are defined in any rigid way, this allows for many interesting villains that The afterlife and the mystical do not exist for a chosen few but for us all if we happen to look where we should not. Though his representation in terms of women and queer characters leaves something to be desired Older’s collection overall paints a stunning city where power actually has little to do with the fantastic.